Aimia Moves Global Headquarters to New Tour Aimia Building in Montreal's Financial District - Aimia Inc.
MONTREAL, May 29, 2014 /CNW Telbec/ – Aimia Inc. (TSX: AIM) (“Aimia”), a global leader in loyalty management, today reaffirmed its commitment to Montreal with the official opening of its new global headquarters in the heart of the Quartier-International district in Montreal, Quebec. The 35-story modern building at the corner of Viger Street and Beaver Hall Hill houses approximately 400 employees in the four floors that Aimia occupies among the 10 commercial floors. As a growing global leader in loyalty management with evolving commercial and corporate needs, Aimia outgrew its original office space in Montreal and wanted to create an environment that better reflects its brand and culture. 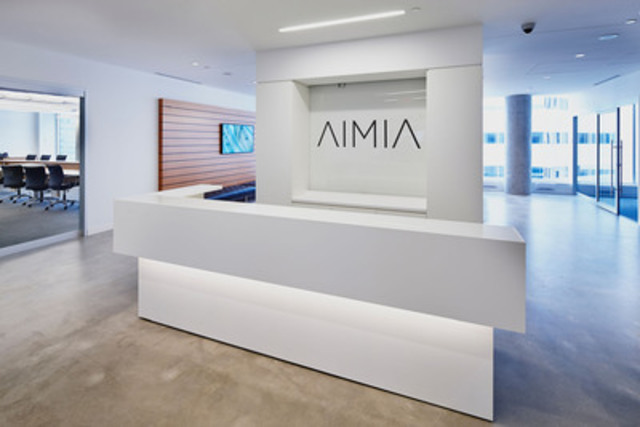 Aimia still maintains two other offices in Montreal for its Call Centre facilities and technology project teams. Tour Aimia/Altoria was developed by Kevric Real Estate Corporation as a mixed-use complex including 230,000 square feet of office space on the first 10 floors and 25 floors dedicated to the Altoria residential project. In line with Aimia’s commitment to the environment, the office space was designed to achieve Leadership in Energy and Environmental Design (LEED) Gold certification; the second highest in terms of environmental requirements. Aimia’s office also provides an exclusive terrace, includes quiet spaces called iSpace and iLabs where employees can collaboratively explore and define new ideas as well as a connection to Montreal’s underground city RÉSO. Selected artwork by Canadian artists is installed throughout the office to not only enhance the work environment, but also inspire employees, promote dialogue and encourage creativity and innovation. Aimia’s collection in Montreal has chosen to feature a wide range of Quebec artists in its Tour Aimia offices in support of the vibrant arts community in the province of Quebec and more specifically in Montreal. Artists range from very well established to emerging and reflect Aimia’s commitment to fostering Canada’s artistic talent. Working alongside the collection Prêt d’œuvres d’art (CPOA) du Musée national des beaux-arts du Québec, part of Aimia’s artwork was chosen by a committee of employees. The CPOA contributes to raising public awareness about the originality and the diversity of the current creation in Quebec while playing an important role in the art community. With over 40 leased pieces of art, the initiative represents the first large collaboration of the CPOA with a private company. For more details on Aimia’s installation of Canadian artwork, visit: www.aimiahq.com. To view photos of the new Aimia office or for more information please visit: www.aimiahq.com.